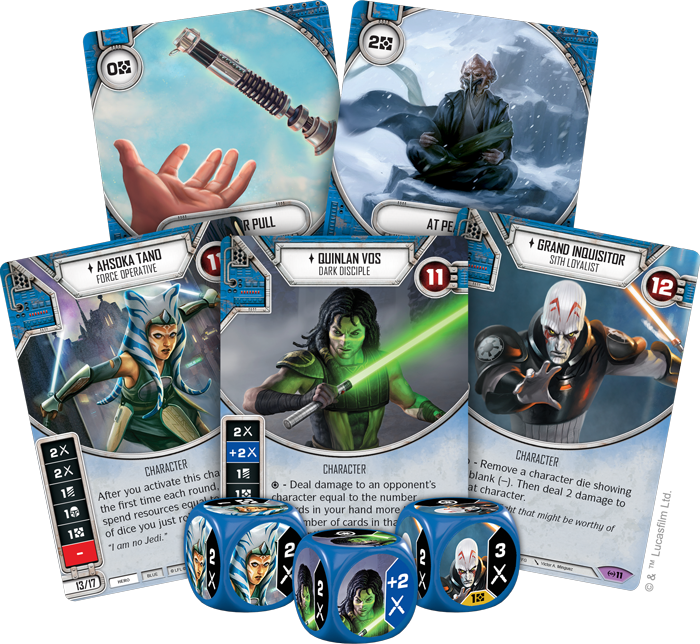 Today we're previewing the Blue heroes and villains of Empire at War, the newest set of boosters for Star Wars™: Destiny. 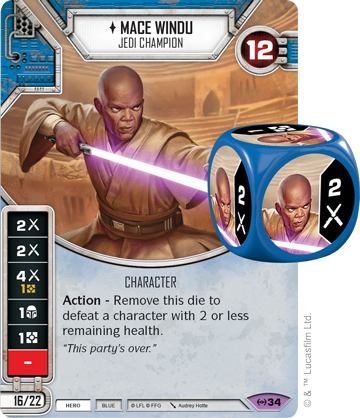 As characters with a connection to the force, these cards specialize in manipulating dice to get the results you need to bring your enemies to bear. In the years following the rise of Emperor Palpatine, the remnants of the Jedi Order often found purpose in fighting the Empire and in inspiring the burgeoning Rebel Alliance. Former apprentice of Anakin Skywalker, Ahsoka Tano (Empire at War, 31) received her Jedi training during the tumultuous Clone Wars, and though she eventually left the Order, Ahsoka continued to use the Force as a hero in the early days of the Rebellion. 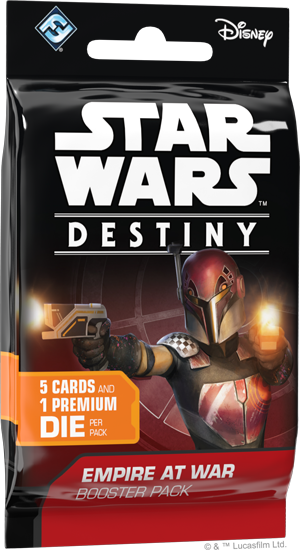 Ahsoka comes to Destiny costing thirteen points for a normal version, or seventeen for an elite. Ahsoka’s die features two melee sides, a discard side, a shield, and a resource symbol. Ahsoka is an incredibly efficient character, as well—the first time you activate her every turn, you may spend one resource for every die you just rolled to ready her. An additional activation is a powerful tool, essentially letting you reroll all of her dice once they have been resolved. Ahsoka is a perfect target for a multitude of Blue weapons, including the new Shoto Lightsaber (Empire at War, 51). The Blue weapon features one melee damage symbol, two modified melee damage symbols, a shield symbol, and a resource symbol. While this can greatly increase your damage output, Shoto Lightsaber also features a special ability. After you activate an attached character, if it has another Blue weapon, you may give it one shield or remove one shield from a character. The Shoto Lightsaber is designed to work well on a heavy damage dealing character that already has another Blue weapon attached. If you have two Shoto Lightsabers on a character, they can trigger off each other to either provide or remove two shields. If a Shoto Lightsaber is equipped on Ahsoka, you could even have the opportunity to use the Shoto Lightsaber’s ability multiple times per turn. 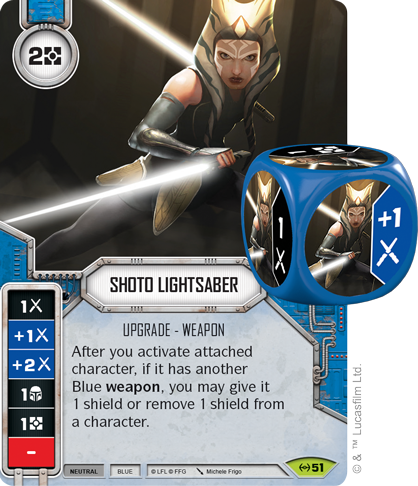 In order to get these weapons more consistently, Lightsaber Pull (Empire at War, 130) is a great addition to Blue decks. 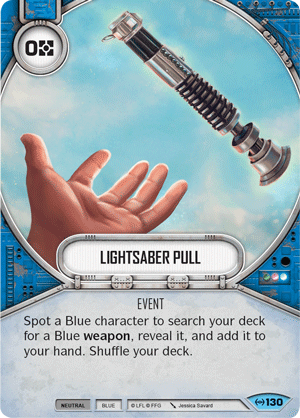 Lightsaber Pull is a zero-cost event that allows a player to search their deck for a Blue weapon and add it to their hand. This can allow you to consistently play powerful Blue weapons like the Shoto Lightsaber. As a young Jedi during Order 66, Kanan Jarrus (Empire at War, 33) went into hiding for many years before reemerging during the Rebellion against the Empire as the mentor of Ezra Bridger. 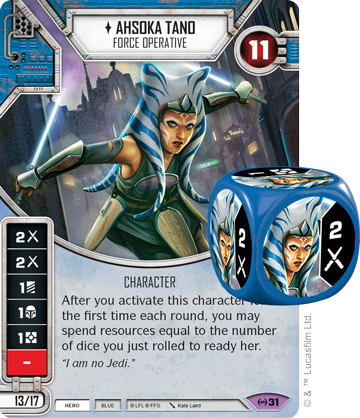 Kanan joins Star Wars: Destiny as a Blue hero costing ten points normally or thirteen for an elite version. Kanan has a diversified die, with sides showing ranged damage, melee damage, a focus, a disrupt, and a resource. Furthermore, before you take an action, you may resolve one of his die. 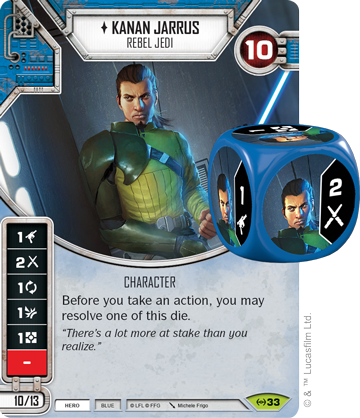 This action efficiency allows you to double up on your actions, as you don’t have to use a full action to resolve one of Kanan’s die. 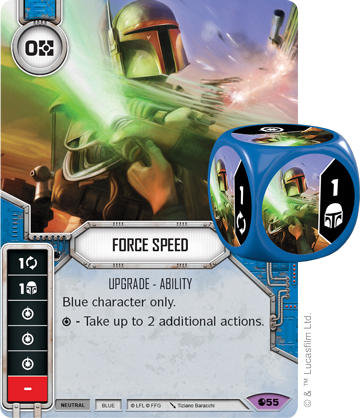 Equipping Kanan with a Force Speed (Spirit of Rebellion, 55) can help you get the most out of your turn, resolving Kanan’s die before using the special symbol on Force Speed makes for an action-packed turn. Blue characters have always been experts at dice manipulation, and Empire at War brings that theme to its extreme. 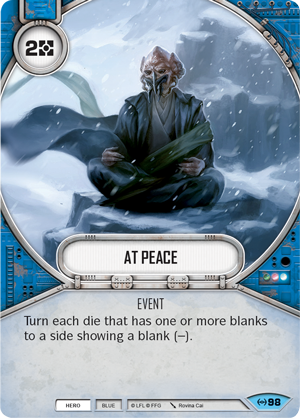 At Peace (Empire at War, 98) is an event that costs two-resources and turns all dice on the field with a blank side to that blank side, including your own. 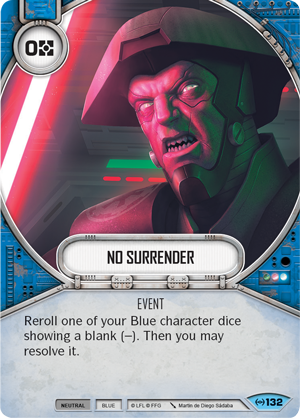 This can be used to your advantage with cards like No Surrender (Empire at War, 132), which lets you reroll a blank die and then resolve it. 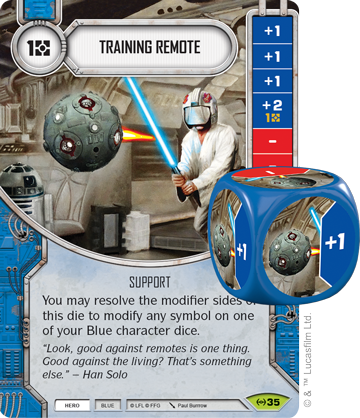 Blue heroes can modify their dice further with Training Remote (Empire at War, 35), a support with four modifier sides that can be used to modify any symbol on a Blue character die. This can give your Blue characters’ die additional value. Blue heroes like Mace Windu (Empire at War, 34) can deal massive damage when guided by the skills learned sparring with a simple training remote. Blue villains revel in their service to the dark side, and with an Empire at War feeding their anger and hatred, Blue villains continue to dominate their foes by manipulating dice and sacrificing their own resources in the pursuit of ultimate power. One of the Rebels most persistent foes, the Grand Inquisitor (Empire at War, 11) was a former Jedi Temple Guard who turned to the dark side after the rise of Emperor Palpatine. During the early days of the Rebellion, the Grand Inquisitor hunted down surviving Jedi, eventually leading him to cross paths with Kanan Jarrus and Ezra Bridger. 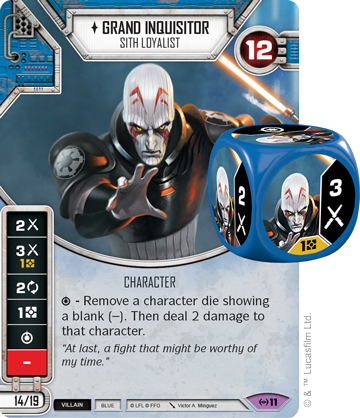 The Grand Inquisitor enters Star Wars: Destiny as a Blue villain costing fourteen points for a normal version, or nineteen for an elite. His die includes two melee damage sides, a focus side, a resource side, and a special symbol. The Inquisitor’s special symbol allows a player to remove a character die showing a blank, then deal two damage to that character. This is an extremely versatile ability that not only allows you to remove a die that may otherwise be rerolled, but also deal damage to a character. 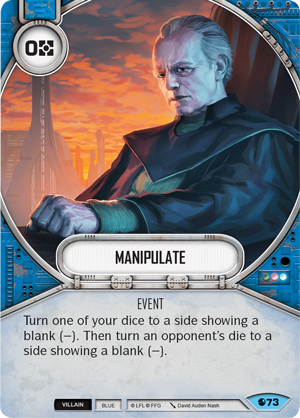 Even if your opponent rolls no blanks, cards like Manipulate (Spirit of Rebellion, 73) allow you to turn an opponent's die to a blank side, making it a target for the Grand Inquisitor. 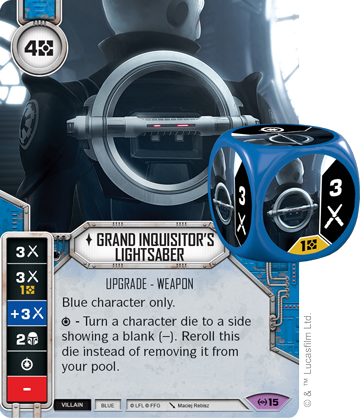 Of course, one of the best ways to turn a die to a blank is with the Grand Inquisitor's Lightsaber ( Empire at War, 15), a four cost upgrade. The lightsaber includes three melee damage sides, a shield side, and a special symbol that allows you to turn a character die to a blank before rerolling the Lightsaber’s die into your pool. Not only will this consistently roll melee damage, but the ability to turn a character die to a blank side pairs perfectly with the Inquisitor himself. Like the Inquisitor, an Empire at War pushed Jedi Master Quinlan Vos (Empire at War, 8) to the dark side. 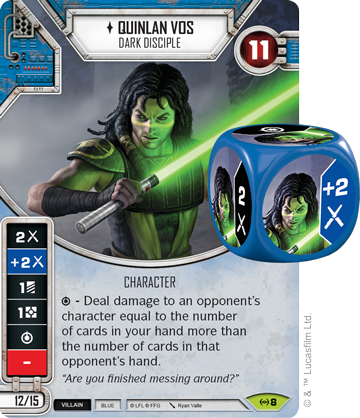 Quinlan Vos enters Star Wars: Destiny with twelve points for a normal version or fifteen for an elite. His die includes two melee symbols, a discard symbol, a resource symbol, and a special symbol. Vos’ special ability allows you to deal damage to a character equal to the amount the cards in your hand that exceed the cards in your opponent’s. 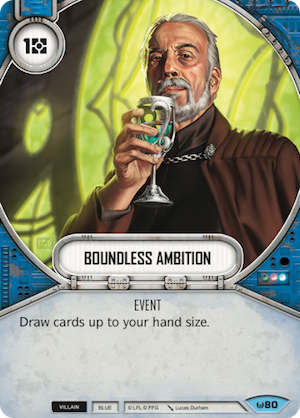 When combined with cards like Boundless Ambition (Awakenings, 80), you can always make sure you have plenty of cards to fuel Vos’ ability. 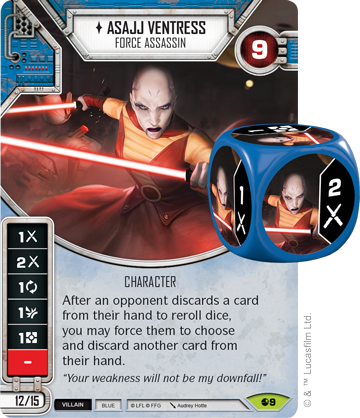 An elite Quinlan Vos combined with an elite Asajj Ventress (Spirit of Rebellion, 9) can keep your opponents’ hand size low while maximizing damage. Turning your opponents dice to blanks is a consistent theme for Blue villains, and can often lead to your opponent getting rid of cards to reroll them. 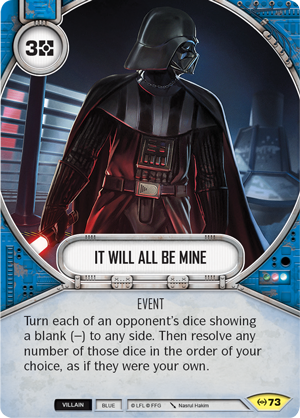 While this is a significant advantage, Blue villains now have a powerful tool in It Will All Be Mine (Empire at War, 73), a three-cost event that allows you to turn all of your opponent’s blank dice to a side of your choice, and then resolve them as if they were your own. The more blanks your opponent rolls, and the more blanks you give them through effects like The Grand Inquisitor’s Lightsaber, the more powerful It Will All Be Mine becomes. Blue villains are also known for sacrificing their own health to dominate their foes. 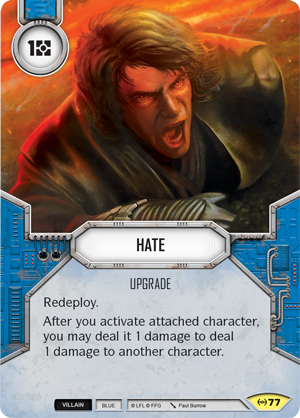 Hate (Empire at War, 77) is an upgrade that allows you to deal a damage to the upgraded character every time they activate to deal one damage to another character. Hate allows you to control the flow of the game and ensures your opponent’s characters won’t escape the damage your characters’ deal. 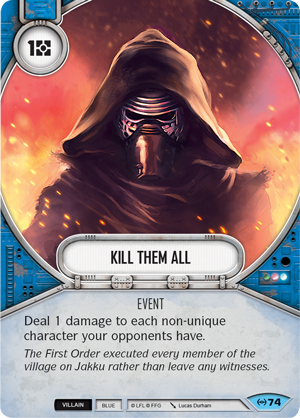 Kill Them All (Empire at War, 74) allows you to deal one damage to each non-unique character your opponents have, allowing you to continually damage your opponents' characters regardless of your dice rolls. Empire at War sees Blue characters expand on their ability to control dice and have complete control of the game through the power of the Force. Use the Force and purchase Empire at War (SWD07) from your local retailer in the third quarter of 2017.